UPDATE 5PM: Police are still searching for a man acting suspiciously near a Sunshine Coast school this afternoon. It is believed the man evaded police through Nambour and bushland behind a school. The incident put St John's College on a temporary lockdown. EARLIER: 4.20PM: Nambour's St John's College is no longer in lockdown, but police are still searching for a man who evaded police. A dog squad was used to search the premise on Hall Ct and PolAir was considered an option. It is believed the man made have gone into a creek. The man's white audi has been towed from the scene. INITIAL: A SUNSHINE Coast school is in lockdown and a person is on the run from police this afternoon. St John's College Nambour is on high alert after police were called for to a "suspicious vehicle" seen near the Hall Ct premise. A Queensland Police media spokeswoman said officers were called in at 2.45pm and were searching the area. 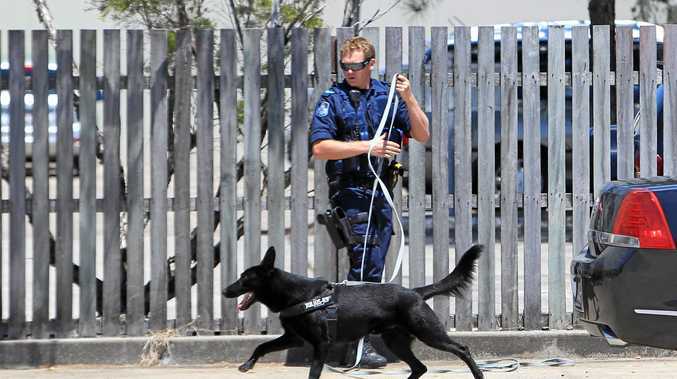 "The dog squad unit has been deployed but it could be only precautionary at this stage," the spokeswoman said. "They were hoping to call in PolAir but were unable to." She said a white Audi had been found at the scene. It is understood to be stolen and is set to be towed away. A person of interest is at large.